The Ritz Cigar Lounge features wood panelling, sumptuous yellow chairs and a state-of-the-art ventilation system that meets strict air-quality regulations without interfering with the cozy, intimate atmosphere. The Ritz, one of the most venerated of London’s many luxurious hotels, enjoying pride of place in the heart of the St. James’s neighborhood, has been around for more than a century. But, the first thing that now greets visitors upon entering is brand new: The Ritz Cigar lounge. 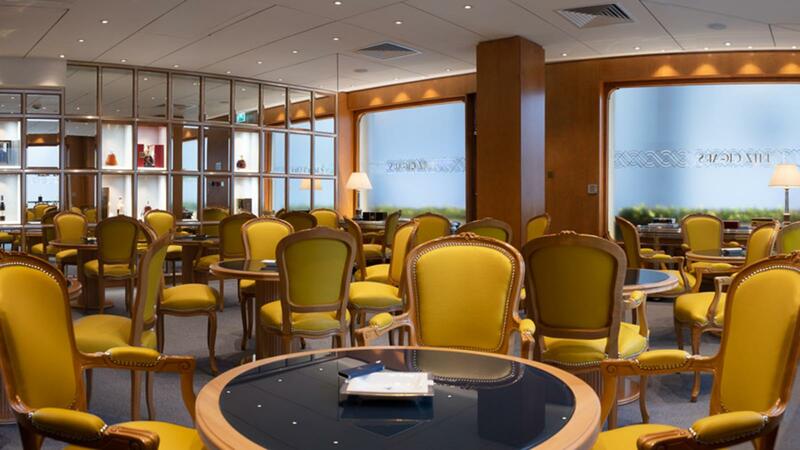 A recent addition that is fast becoming a tradition of its own, the lounge offers a wonderful place to carefully choose a fine smoke to enjoy with a nicely chilled Champagne, wine or a serious cocktail. The Ritz has joined the growing list of luxe London hotels offering refuge to cigar smokers, helping the city keep its status as Europe’s cigar capital despite some draconian laws that tried—but failed—to curtail smoking in public places. The key for The Ritz is the state-of-the-art ventilation system that meets strict air-quality regulations without interfering with the cozy, intimate atmosphere. Some of London’s most popular cigar lounges solve this vexing problem by placing most of the seating in the open air, with heaters and blankets provided during the long, wet winter. That’s not necessary at the Ritz lounge, which is fully inside the hotel. 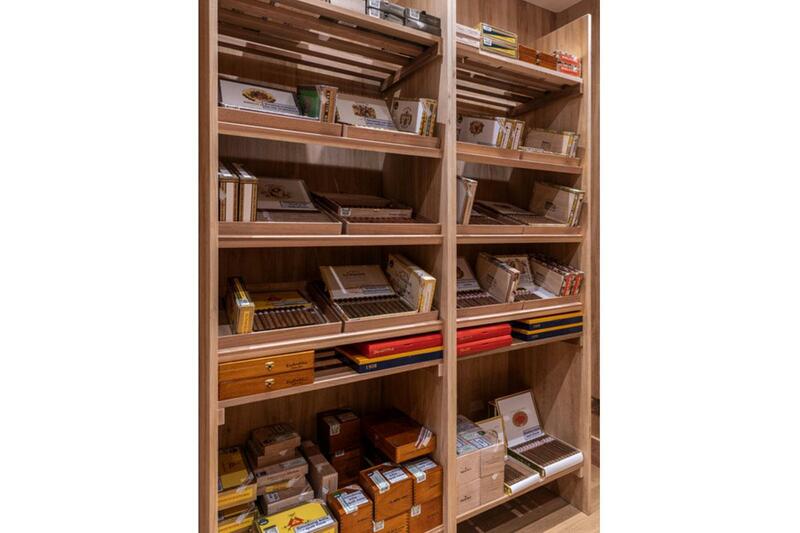 The room itself has a wonderful aroma emanating from the fine, mostly Cuban cigars on display in the walk-in humidor. There is a quiet, Old World feel, set off by the wood panelling and the sumptuous yellow chairs. The walls are decorated with black-and-white portraits of the great and the good indulging. It’s no surprise to see George Burns or Roger Moore puffing away, but the photo of the tuxedo-clad Ringo Starr and George Harrison each smoking good cigars while Ringo gives an exuberant thumbs up carries a certain nostalgic British fizz. This is a hotel that has hosted famous smokers like Charlie Chaplin and Winston Churchill, so there is no doubting its authenticity as a purveyor of fine smokes. The humidor offers a wide variety of excellent Cuban cigar choices. Cigar sommelier Alex Sumerauer likes to offer each visitor a personal service, sometimes suggesting they try new things. Nothing here is rushed. 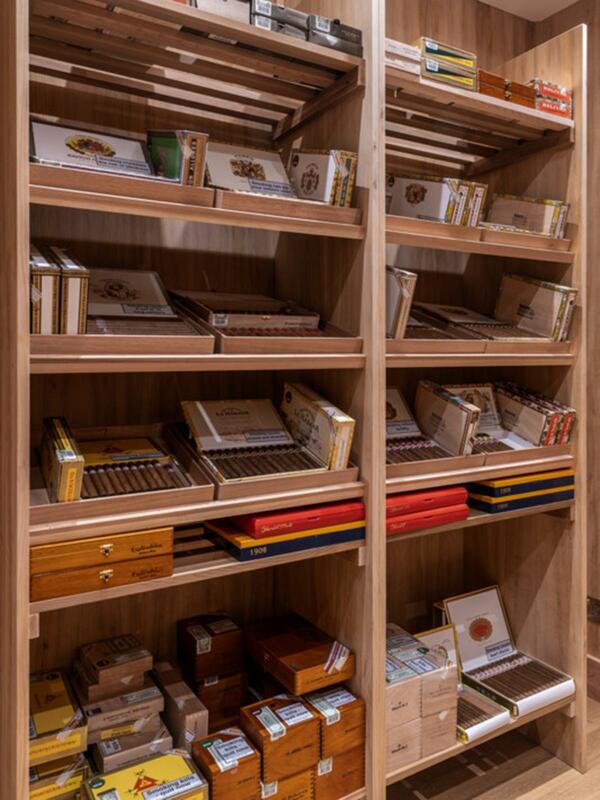 The humidor is spacious and uncluttered, its shelves lined with an impressive array of familiar smokes along with a special collection of Ritz London Cigars, including the Ritz 1906 Laguito collection (marking the year the hotel opened), ranging from 60 to 80 pounds ($76 to $102). The prices are in line with the several noteworthy cigar shops located in the surrounding blocks of St. James’s, topping out with the increasingly rare Cohiba Behike BHK 56, selling for 210 pounds ($268). Cigar sommelier Alex Sumerauer, who views the Hoyo de Monterrey Epicure No. 2 priced as 34 pounds ($43) as a personal favorite, likes to offer each visitor personal service in the humidor, sometimes suggesting they try new things. For instance, steering a Montecristo No. 2 (44 pounds, or $56) devotee toward a Vegas Robaina Unicos (42 pounds, or $53) as an experiment. “Same similar style, very rustic cigar, unknown to many people even though Alejandro Robaina was such a famed cigar wrapper-grower, may he rest in peace,” he says. For those who have the time to try a longer, vintage cigar, he recommends a 1998 Sancho Panza Sancho, a 47 ring gauge A-size cigar priced at 56 pounds ($71). 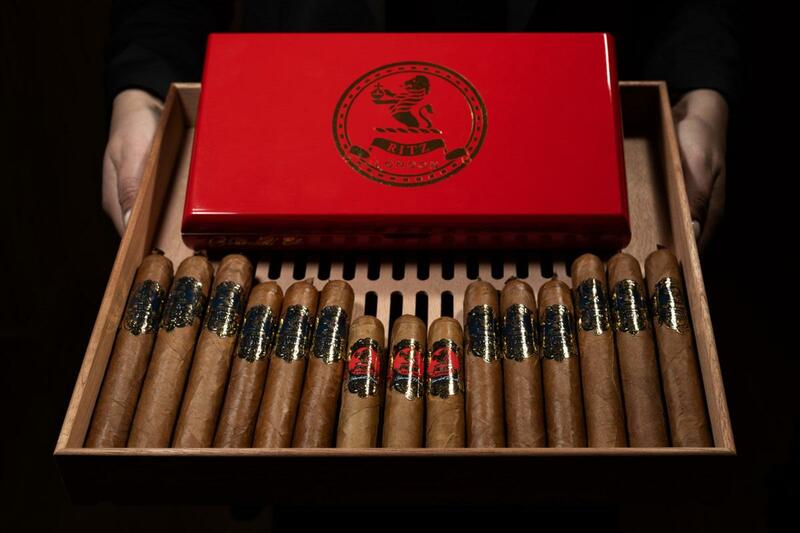 The special collection of Ritz London Cigars. The lounge has the advantage of being located next to the hotel’s Rivoli Bar, so it’s easy for smokers to have a cocktail, wine or Champagne brought over. That has led to an increasing collaboration between Sumerauer and wine and beverage manage Giovanni Ferlito over the best ways to pair certain cigars and drinks. He’s fond of trying new combinations: a slightly peaty single malt Scotch from Islay, for example, with a Partagás 2, or a Syrah from the Rhone Valley with a full-bodied Montecristo. The addition of the lounge has made The Ritz once again a haven for smokers, and has added to a most favorable trend that has seen London offer cigar lovers a wide variety of excellent choices. Open Sunday through Saturday: 10 a.m. to 11 p.m.